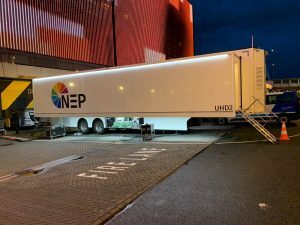 NEP The Netherlands, a division of the NEP Group, has added a new flagship outside broadcast truck to its fleet. UHD 2 is equipped with the latest broadcast capture technology and completes the broadcast and media technology company’s multi-cam line-up. “With this truck, we can now offer a suitable solution for every type of production and budget,” said Theo Stam, lead solutions consultant at NEP The Netherlands. UHD 2 is the largest OB truck in NEP’s European fleet and allows for production to be controlled with more than 24 cameras. The truck can handle many types of cameras including large sensor cameras and it features a high-end audio desk that is ideal for sports and entertainment programmes, where UHD HDR images and audio are crucial for the home experience. Theo Stam said: “We had the choice to upgrade our existing NL 2 OB truck, which would have been financially attractive, or to have a new one built. Since the demand for UHD registration is increasing and we prefer for our people to work with the latest technology, we decided on the latter. NEP The Netherlands’ OB fleet is no longer only meant for domestic work, but for the entire European market. Divisions in other countries use the same technology, which means that not only resources but also people can be easily exchanged. 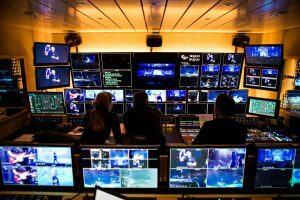 The baptism of fire for the UHD 2 took place Wednesday 3 April in the Ziggo Dome in Amsterdam with a concert production of Eros Ramazzotti in UHD with 21 cameras. Production of the World Ice Hockey Championship will take place in Slovakia from 10 May.